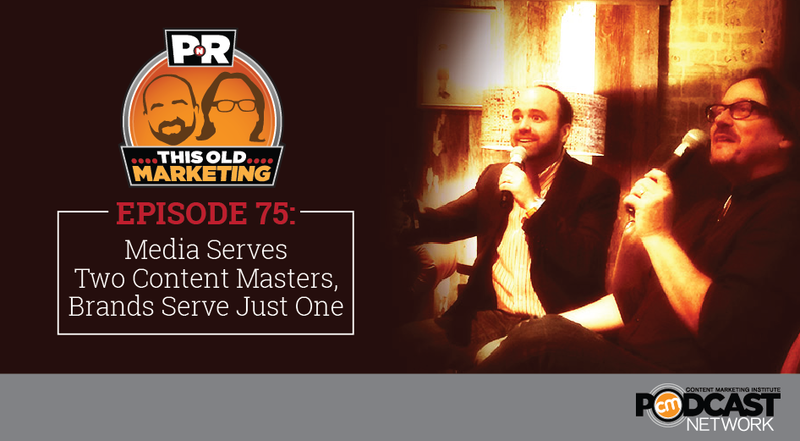 In this 75th episode of PNR’s This Old Marketing, Robert and I celebrate “mobilegeddon” by explaining how Google’s new search algorithm favors brands and publishers that are committed to serving as “go-to” sources of content. We also ponder how content marketing will evolve in 2015, and identify an important advantage brands have over publishers. We question the American Society of Magazine Editors’ decision to back off of its hard-line stance toward native advertising and ponder the implications of BuzzFeed killing several articles due to advertiser complaints. Rants and raves include a seriously flawed take on marketing automation and the rosy future for monetizing content painted by Time Inc.’s new CEO. We wrap up the show with a #ThisOldMarketing example from The Caslon Company. Google update is only affecting mobile search results (4:37): Search Engine Land provides a Q&A on Google’s latest algorithmic change – dubbed “mobilegeddon” – which affects how it will display search results on mobile devices. Search results on desktop devices will not be affected, contrary to what Robert and I reported last week. This article is paired with the next one from Moz. How Google’s evolution is forcing marketers to invest in loyal audiences (6:16): Rand Fishkin from Moz says the evolution of Google’s search algorithm is increasingly favoring websites that are “go-to” resources for their audiences. He advises brands to focus on cultivating a loyal audience with consistently valuable niche content, which is what Robert and I have been saying on this podcast all along. Ways content marketing is going to change in 2015 (8:40): John Rampton, in an opinion column for Forbes, outlines seven of the most obvious and significant ways content marketing is changing this year. Robert and I are surprised that very few trend articles, including this one, focus on audience development. We also discuss why small companies have a big advantage over large brands in creating amazing experiences for their customers. Native advertising softens hard line on native ads (25:19): The American Society of Magazine Editors, which has barred magazine editors from writing advertorial content, has surprisingly softened its stance in a new set of guidelines. I disagree with this decision, and explain why the model adopted by The New York Times and The Wall Street Journal is the preferred way to avoid conflicts of interest between the editorial and ad sides of the business. Robert points out why this model also clarifies the rules of engagement for marketers. BuzzFeed deleted three posts due to advertiser complaints (31:34): BuzzFeed recently released the results of an internal audit, which revealed that it deleted three articles because of advertiser complaints. In each case, staff writers had written negative posts about current or past advertisers. Robert and I reveal why brands don’t have to play by the same rules as traditional print and digital publishers and explain why that’s a significant advantage. This Old Marketing is sponsored by Widen Enterprises, a digital technology company that specializes in digital asset management. Widen is offering another new report authored by Robert Rose, Digital Assets Should be Agile, Not Fast. Today, a growing number of marketers are dancing to the tune of agile marketing. 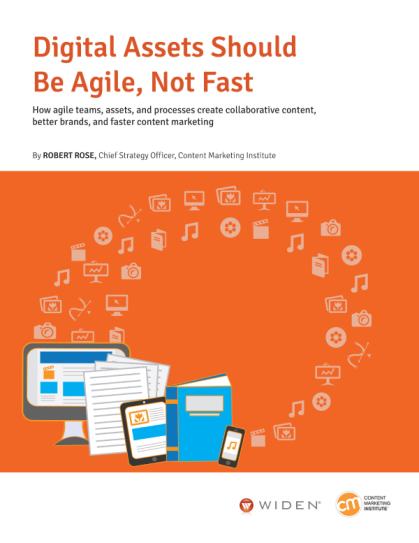 Agile teams, assets, and processes can create collaborative content, better brands, and faster content marketing. But what often gets lost is the distinction between agile and fast. Learn more at http://bit.ly/widen-agile-assets. Robert’s rant: Distinguished professor Thomas Davenport’s opinion piece in the CIO column of The Wall Street Journal focuses on what automation will do to marketing and marketers. He predicts that creative efforts in the near future will be partially assisted by automation, and that high-level marketing decisions will be made by software. Robert vehemently disagrees. This article is paired with the following article from CMSWire. Robert’s rave: In this article, CMSWire explores the growing sophistication of technology, which may soon be able to partially automate the production of some content. The publication then asks several content marketing experts for their opinions on this potential development. They unanimously agree that technology will never replace human judgment and creativity. Robert strongly agrees, and explains why marketing automation data is not an end unto itself. He then points out what marketers must do to remain remarkable and create amazing customer experiences. Joe’s rave/rant: In an interview with DigiDay, Time Inc.’s new CEO, Joe Ripp, predicts that the giant publisher will soon be able to start selling readers products. I agree; we’ve been talking about this idea on the podcast for some time now. However, I disagree with Ripp’s focus on micro-payments, which I view as an antiquated model. I also disagree with Ripp’s opinion that “quality content will always prevail,” and I explain why. The Caslon Company: From 1911 to 1914, B2B ad agency The Caslon Company published a magazine entitled The Graphic Arts: A Magazine for Printers and Users of Printing. It was focused on helping its clients use graphic design and advertising effectively. 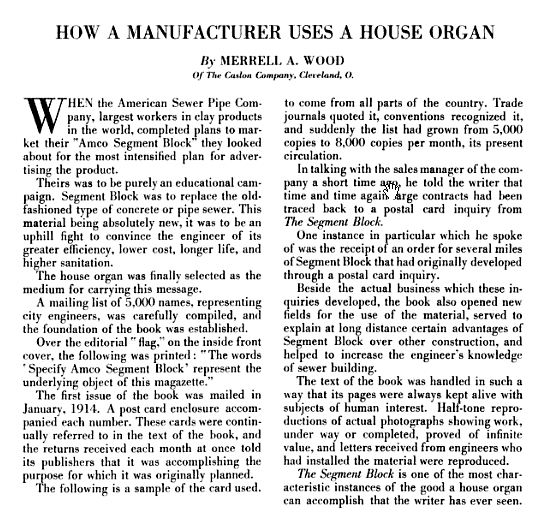 One outstanding article tells the story of the American Sewer Pipe Company, which developed sewer pipes made out of clay. The manufacturer knew it would face an uphill battle convincing city engineers to accept this new technology. So, it created a magazine that contained thought leadership articles about new scientific approaches to sewer technology, human interest articles, and case histories. It employed photographs and illustrations to explain technical concepts, and even included letters from its subscribers – an early example of user-generated content. It was mailed to a carefully compiled list of 5,000 city engineers. To measure its success and enable sales inquiries, American Sewer Pipe included a postcard in each issue. The publication was so successful that it was quoted in trade magazines and at conventions, and its circulation quickly grew to 8,000 readers in its first year of publication. This is a remarkable turn-of-the-century example of a company that used excellent content to gain acceptance for its new technology.